Lake in the Hills police and firefighter/paramedics responded about 4:52 PM Friday February 8, 2019 to a barricaded subject near Harvest Gate and Polaris Drive, Lake in the Hills. Police and firefighter/paramedics received a report that a barricaded subject, possibly armed with a weapon was in a townhouse. As of 9:00 p.m. police were still on the scene. SWAT members left the scene just before 10:30 p.m., and neighborhood residents unable to get to their homes gained access to their block about 10:30 p.m., when a second Nixle alert announced roads had reopened. Lake in the Hills SWAT nixle screen capture. 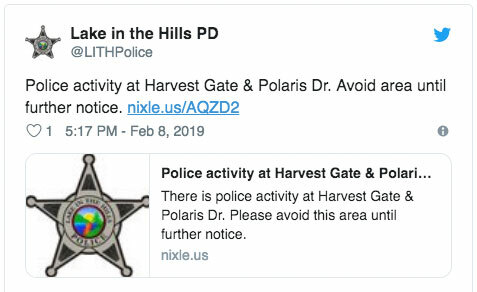 Lake in the Hills Police Activity Alert Friday February 8, 2019 screen capture. The Initial Alert had not been replaced by the Expired Alert (below) which has no historical information. Lake in the Hills Police Activity Expired Alert (CARDINAL NEWS screen capture).